The Beach is OPEN and its spectacular !! The $3.5 million dollar Beach enhancement is completed and open, receiving excellent comments from everyone . 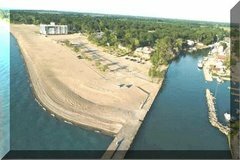 Grand bend Beach has also received the Blue Flag designation along with the Grand Bend Harbour and the Port Franks Harbour. Posted by Larry Broadley at 7:05 a.m.